Which European Budget Airlines Can You Trust? Following the collapse of Primera Air earlier this month, travelers may be wondering what the risks are when booking with Europe’s low-cost carriers. Primera Air suddenly ceased flying on October 1, declaring bankruptcy. The budget carrier reportedly left thousands of passengers and dozens of employees stranded across its route map in the process. Passengers were forced to rebook with other airlines on their own dime to continue their travel. Indeed, there wasn’t even staff left at Primera to assist—the airline had completely disappeared and the company website shut down. An email to Primera went unanswered. While such news can seem like a shock, especially to air travelers who are directly impacted, Primera’s demise is unfortunately not all that uncommon among budget airlines worldwide. Primera is just the latest in a string of examples, in Europe and elsewhere, that includes carriers such as Monarch (which collapsed last year in one of the biggest failures of a British carrier) and Air Berlin (which filed for bankruptcy last year after its funding was pulled). What Are the Risks When Flying With Budget Carriers? The bad news is that any of the European budget carriers could let you down and in a myriad of ways. The problems can range from canceled flights because of maintenance issues or labor strife, to customer service that is slow to respond or slow to refund, all the way to going out of business. Ignacio Cetrangolo, a former Primera passenger who commented on Reddit about his woes, recounted his own such tale after he and his girlfriend were slated to fly on Norwegian from Boston to Paris in early October and on Primera on the return leg home. Primera went under just before his outbound travel was to begin. “What should have been a cheap fun weekend getaway became a nightmare the day before our flight,” Cetrangolo wrote in an email. “The price for it all went up by 400 percent over our original planned budget,” he added. Nevertheless, he hopped across the pond with his original ticket on Norwegian but was forced to rebook on Aer Lingus to get home. So, why do airlines like Primera go belly up? According to Martin Harrison, a consultant to airlines with ICF Aviation and a former executive at Spirit Airlines and EasyJet, “Airlines stop operating not because they are low-cost carriers, but because they run out of cash to service their commitments.” Airlines are facing headwinds with rising fuel and labor costs, their two largest expenses. And the low-cost business model is predicated on operating the aircraft many times per day in order to make more on the so-called ancillary fees such as baggage and on-board services (especially when they are often losing money on the passenger fares compared to per-passenger costs). Travelers shouldn’t need to pore over airlines’ financial statements before booking. However, doing some advance research will help them avoid being caught unaware. Passengers impacted by an airline insolvency can take some solace in the fact that they will likely receive a good chunk of their money back for their flight if they paid with a credit card. Credit card companies traditionally reimburse the original fare as the service was not rendered, according to a credit card company spokesperson. However, if passengers paid by debit card, they will not likely be covered. If passengers still wanting to travel despite the insolvency, or worse, are stuck abroad mid-trip because of it, they’d need to rebook at their expense. A spokesperson for American Express confirmed that their card members would still be responsible for trip modification costs. In the case of the Primera bankruptcy, British Airways, Virgin Atlantic, and others stepped in to repatriate passengers at reduced fares. But passengers still needed to pay for those flights. Third-party travel insurance can provide a false sense of security. Many plans do not cover airline insolvency, and those that do, such as Allianz, cover only certain listed carriers. While travel insurance may be helpful for other travel issues such as a medical emergency or in the case of unexpected job loss, it is not always a reliable safety net in the case of airline bankruptcy. Another possible avenue for recuperating some of the losses is EU Regulation 261. The regulation mandates carriers offer various levels of compensation to passengers in the case of overbooking, delay, or cancellation—up to €600 (or US$695) for flights between North America and Europe on a European carrier. Several companies, including Airhelp and Flightright, offer to seek reimbursement for passengers, taking a percentage cut of any eventual proceeds. Passengers can also often make the claim themselves via the carrier’s website. Ryanair, EasyJet, Vueling, and WizzAir are each considered well-run airlines with relatively stable business models. The youngest of the bunch is WizzAir, which has 15 years under its belt. These airlines typically do not fly long-haul across the Atlantic. “The big low-cost players all have great balance sheets and can withstand disruptions to plans. The little ones, not always so,” said Harrison. Ryanair arguably wrote the rules of the modern low-cost, low-fare airline, borrowing and perfecting a model pioneered by Southwest in the United States. Ryanair and its competitors are among some of the most profitable airlines in the world, according to Airline Weekly. Although Ryanair cancelled thousands of flights earlier this year due to labor unrest, this kind of disruption is not unusual in the aviation industry. Watch closely, however, because Ryanair’s labor woes are not over; Ryanair only recognized pilots unions in December 2017 to avert a strike over the holidays. The airline’s annual report notes that its “unions may have unrealistic expectations” about salaries and working conditions. The unions will undoubtedly disagree and the fight will play out in 2019. New airlines pop up frequently in Europe. These carriers generally have small fleet sizes—30 aircraft or fewer. (The more established carriers have much larger fleets; Ryanair, for example, has more than 400 aircraft and more on order.) If you’re flying from London to Edinburgh, you may connect with FlyBe. Off to Estonia? Hello, Air Baltic. The list of these upstart and regional carriers is large and growing, and they include Air Italy, Blue Air, Jet2, Pegasus, and Volotea, among others. There is a risk in flying with a smaller carrier. When an airline only has 15 aircraft, it is much more difficult to swap in aircraft on short notice. Nevertheless, if you do your homework before you book you’re more likely to avoid problems. Search the news related to the airline. Read the airline’s posts on social media. Are fellow passengers frequently complaining in the comments about operational issues such as cancelled flights and slow refunds? (As an example, there were such complaints with Primera). Similarly, check out travel forums on Reddit. Finally, Skytrax, the airline review site, maintains a handy database of passenger reviews and rankings to peruse. Lufthansa, Air France, and IAG (the parent company of British Airways, Iberia, Aer Lingus, and Vueling) have all entered the mix with their own wholly-owned low-cost carriers. Lufthansa-owned Eurowings is an amalgam of Brussels Airlines, Germanwings, and Eurowings—plus a dollop of aircraft acquired from the now-defunct Air Berlin. 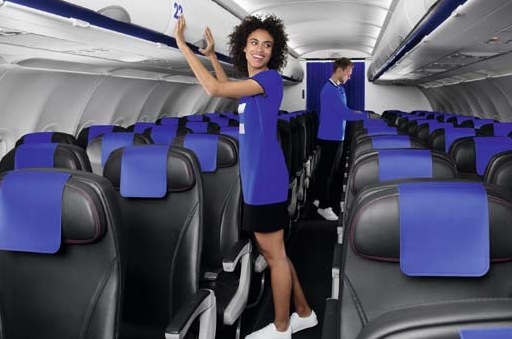 Similarly, Air France has gotten in the game with its low-cost creation called Joon (the name is a play on the French word jeune, which means youth). IAG’s Level is still a small player with only nine aircraft—so you’re not likely to encounter Level in your travels just yet. The main benefit to passengers for flying these carriers is that if there’s a cancellation due to equipment issues or you misconnect, the airline will likely accommodate you with a partner airline in its larger network. Flying passengers across the Atlantic inexpensively has long been a dream of aviation entrepreneurs, starting with Sir Freddie Laker and Laker Airways in the late 1970s. For five years Laker operated long-haul, low-fare flights between London and New York. The airline failed in the face of the early-1980s economic downturn. Unfortunately, the model has not proven to be as viable as the short-haul version practiced by Ryanair and its contemporaries. U.S. travelers are likely familiar with Norwegian because of its low fares to Europe. Norwegian flies state-of-the-art Boeing 787 aircraft. Nevertheless, industry sources urge caution. “Tickets for Norwegian and WOW [the Icelandic low-fare airline] should be purchased only with credit cards and with risk factors understood,” said Scott Hamilton, an airline industry analyst with Leeham News. He also said he believed that Icelandair is stable. These carriers do not separate long- and short-haul operations in their financial disclosures, and the reports on Norwegian’s financial standings have been very mixed, with some predicting blue skies ahead for the carrier, while others report that the low-cost airline faces some challenges. French Bee is a new entrant and flies a limited route map that includes San Francisco, Paris, Tahiti, Punta Cana, and Reunion Island. It has a fleet of three aircraft, including new Airbus A350s. If you find an inexpensive fare and your travel isn’t critical, it might be a good option if you can ride out some potential growing pains (passenger reviews on sites such as TripAdvisor and Skytrax are quite mixed). With any low-cost, long-haul carrier, it’s your call whether that risk is worth it for such a great fare to hop across the pond. We hope Norwegian and other low-cost carriers can keep flying the trans-Atlantic skies. Ultimately, each of these airlines has opened the world to legions of passengers who otherwise may not have had the chance.